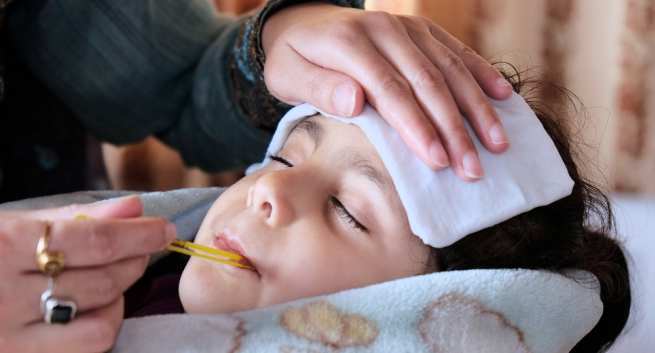 A viral fever is any fever that happens as a result of a viral infection. Viruses are tiny germs that spread easily from person to person. When you contract a viral condition, such as a cold or flu, your immune system responds by going into overdrive. Part of this response often involves raising your body’s temperature to make it less hospitable to the virus and other germs. Most people’s usual body temperature is around 98.6°F (37°C). Anything 1 degree or more above this is considered a fever. Unlike bacterial infections, viral illnesses don’t respond to antibiotics. Instead, most simply have to run their course. This can take anywhere from a couple of days to a week or longer, depending on the type of infection. While the virus runs its course, there are several things you can do to help manage your symptoms. Read on to learn more. Fevers usually aren’t something to worry about. But when they’re high enough, they can pose some health risks. Children ages 0 to 3 months: Rectal temperature is 100.4°F (38°C) or higher. Children ages 3 to 6 months: Rectal temperature is above 102°F (39°C). Children ages 6 to 24 months: Rectal temperature is above 102°F (39°C) and lasts for more than a day. If they have other symptoms, such as a cough or diarrhea, you may want to call sooner. They seem unusually lethargic and irritable or have other severe symptoms. The fever lasts longer than three days. The fever doesn’t respond to medication. They can’t keep fluids down. A viral fever makes your body much warmer than usual. This causes your body to sweat in an effort to cool down. But this leads to fluid loss, which can cause dehydration. Babies and toddlers may benefit from a specially formulated drink with electrolytes, such as Pedialyte. You can also make your own electrolyte drink at home. A viral fever is a sign that your body is working hard to fight off an infection. Cut yourself some slack by resting as much as possible. Even if you can’t spend the day in bed, try to avoid as much physical activity as possible. Aim for eight to nine hours or more of sleep per night. During the day, take it easy. It’s also best to put your exercise routine on a temporary hold. Exerting yourself can further raise your temperature.